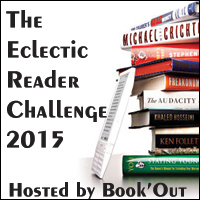 The Eclectic Reader Challenge 2015, hosted by Shelleyrae over at Book’d Out. * Select, read and review a book from each category listed below during the year for a total of 12 books. A book may be in print, electronic or audio format. This is the second challenge I have signed up for this year. I am yet to write a single review, but am not neglecting my reading! When I have a moment’s breathing space between thesis drafts, I shall delve into that next stage of blogging and actually generate some content.